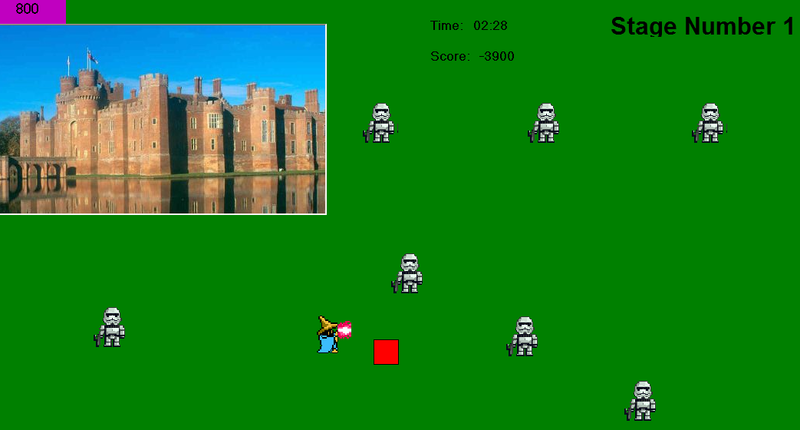 Mage Defense was probably the first graphical game I’ve ever programmed, and had the joy of writing it in Visual Basic SIX POINT OH. This was only a year or two ago, so we’re talking some pretty old software here, could import transparent images or anything, craziness. But I figured I’d throw it up here just to make the collection complete 😛 The concept was mine, on an open prompt for an online, half semester VB class in high school, so I just had some fun with it. Fun fact: there were no enemies or code for enemies 30 minutes before the deadline, and this was the copy I turned in. My first crunch time maybe? Haha. really had a good time with this one, even though it was for a useless Easy-A. I wrote my own hit detection algorithm, projectile firing and moving, etc. Which would explain some of the quirks in them, but it was fun to write really everything myself (at the time I probably didn’t even know there were other options), in a language I didn’t know very well. It’s a .exe and was made in VB6.0, so sorry mac-users.